Winter never fail turn Spring Winter always remind me of that chilling wind, slippery roads, the snow and that black leather jacket of mine when I was abroad studying in Grey country – United Kingdom. Winter also has a deep significant meaning to me. From a Buddhist philosophy, winter never fail to turn spring. It signify no matter what condition one is facing now, in the terms of hardship, engaging in real life and death battles, over unsurmountable obstacles and dwelling in painful personal issues, if one harness oneself and persevere through, the light at the end of the tunnel always await for you. Just as spring always follows on when winter is drawing to an end. It never change, it’s a fact of life. The winter garden POP-UP Greeting card is a heart warming greeting cards for someone special. 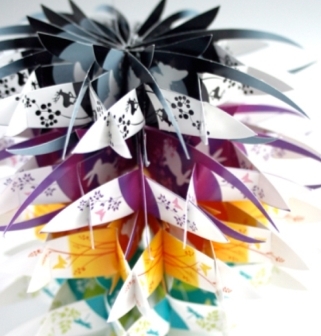 There are six different “paper flower” design to choose from. And this winter is never cold again. Tony Leung asked me to look at your site. Looks great. I really like the winter scene cards! Hoping that the business has a very successful Christmas period. Hope to see you doing some more ads in the UK soon! I love the unique card designs. Is there a website and or tutorial on how to make the pop up designs? I would really appreciate it!